I've been riding mountain bikes since I was about 8. I was blessed that my mother hooked me on two wheels! She has a hunger for big climbs during our rides so while training with her over the years, I've acquired a thirst for climbing mountains on my road or mountain bike. I enjoy suffering, but I attribute my strength to those I train with. Just as influential as my mother, has been my sister. We both ride at similar levels so she's my partner in the gym and outside. I'm more than fortunate to have her in my life. We can girl talk about guys, hormones, life, etc. while huffing up and bombing down the trails. We both know each other's weaknesses and challenge each other to rise above them. 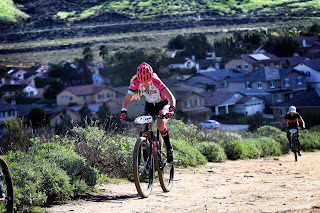 This year is the first year I've been racing in the women's Pro field on my cross country bike. It has been slightly intimidating, to say the least, but a lot of fun! The song "Sucker for Pain" by Lil Wayne and Wiz Khalifa has been my race prep song as it is so true! I've learned a lot about myself, where I want to improve my fitness and mindset, and how to sit in the pain box when my legs and lungs are screaming. You've had a solid #bikelife that started at a young age, how do you feel it has influenced you over the years? Biking has strengthened me as a woman in more ways than one. It has helped remind me to set goals, stay passionate, motivated, take risks, and has served as my therapy more times than I can keep track! Can you take us back to your first mountain bike ride(s)? What did you learn and what inspired you to keep at it? I cannot remember the first time I was on a mountain bike, but I do remember riding in Idyllwild on a heavy purple Walmart bike, trying to chase my parents down! It was hot and being about 8 years old, my sister and I were often motivated to climb mountains by receiving those stretchy Pez necklaces. I rode the Rockhopper on and off until I was about 15 and was then given a hardtail Specialized Rockhopper for my birthday. I rode that bike to the ground and continued building skill alongside my sister. It tremendously helped to have an active family and a mother who planned fun bike adventure trips on weekends throughout the year. Starting off on hardtail mountain bikes was a blessing too, as I learned how to pick fast lines through technical sections. 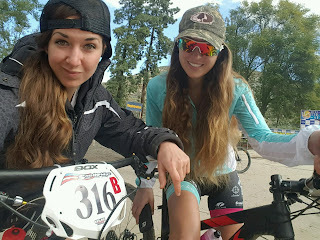 What was the motivation to start competing in mountain bike races? What inspired you to start competing at the Pro level? A few of my friends I rode with suggested I give racing a try for fun. I had raced Downhill before, but the idea of racing XC was a little intimidating, to say the least! My friend lent me his Specialized S-Works and I raced it (clipping in for the first time on a mountain bike) and I was soon hooked! I sold my hardy all-mountain bike and converted to the cross country life haha! I started off in the "Beginner" category and my times quickly started matching those racing as "Pro's", so I felt more ready to upgrade and race against stronger women. What would you say is the biggest change for you since starting to compete at the Pro level? I definitely take riding and my training more seriously. 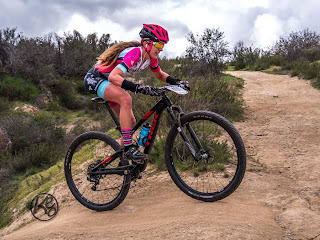 I have sponsors I want to please and represent, as well as fitness goals I want to maintain/meet so my rides are often more intense and scheduled throughout the week. With racing in general, what have you discovered about yourself? I have learned how to set aside pain and re-direct my thoughts to something else when racing. You often have to sit in that box of pain and talk yourself down as your mind starts asking, "Why am I doing this again?" I have found racing isn't simply based on physical fitness, but mental strength as well. Do you have any tips or suggestions for folks looking to attend their first competitive event? Just keep it all fun! Experiment with nutrition and find what does/doesn't work for you regarding fuel prior, during, and after. Set a goal as far as how well you want to perform and work on the fulfilling the steps that will get you there. I was 100% for flats because the idea of being clipped into a 42 pound Downhill bike and falling, wasn't very appealing haha! Your performance increases drastically with clips. I regret being so closed minded about them. You release so much more torque being clipped in. I'm never going back to flats! During my first race as a Pro, I had a very immature competitor foul play me in an attempt to shake me off. Her unprofessionalism almost ended up with me over the bars in a ditch. What she had schemed for the bad, however, I used for the good and powered harder into 2nd place behind my sister who earned top box that day. The racing community is large, and yet very small and there are often certain individuals who lack morals, skill, and integrity. I have learned that in order to stay focused and represent your passion to your best ability, it is best to avoid negative energy and those who enjoy the drama or produce it. Remaining seated during steep climbs is a skill I have been working on. You lose power the minute you get out of the saddle. Simple repetition and strengthening muscle while forcing myself to sit, has helped tremendously! Taking high jumps on a Downhill bike! I always am a little more heavy to the left when I am in air and I can feel it the minute I land. It might be due to the curve in my back; I'm not sure. I don't let it drag me down by understanding that it is an area in biking I may not be able to improve based on my physical form. What do you love most about having a sister that you can regularly ride and train with? I love that I have an automatic best friend with me to share in the good and bad times. We girl talk, cry, and vent as we train. I know her like the back of my hand. When she is weak, I am her strength; when I am weak, she is mine. God has blessed me tremendously with her in my life. I am more than grateful I can train with her. When it comes to riding and racing, do you and your sister enjoy the same styles or are there differences? Although we are a lot alike, we are quite different in our styles. She likes going "all out" on downhill segments. She loves speed and her technical skills and guts are top notch! If the track is super technical, I am a little more reserved from a few almost serious close calls involving my neck on my Downhill bike. I've had my bike land on my back and the seat of my Downhill bike get caught in the Leatt around my neck. Other than that, we pretty much mirror each other. I have Trek Top Fuel 9.9. Absolutely love it!!! The bike is the best of both worlds. It's like a Thoroughbred when I'm climbing, and just as fast when I descend. I took it down some of the runs at our local bike park (don't tell my mechanic haha) and it handled everything really well for a cross-country bike. My mechanic pointed me in the right direction as he always does! I also have a Specialized Tarmac I purchased from a friend and love him just as much! Any words of wisdom that you would like to pass on for other women who may be curious about mountain biking? For some of my girlfriends, the idea of falling and getting hurt completely holds them back. I understand and can see it from their perspective, it's just a matter of going out, having fun, and continually working on your skill. Probably promoting more women-centered rides and clubs at local bike shops. We are in this together! training with women. There's a unity on a different level that can be reached. Plus, guys simply can't girl talk or understand certain things that women can. I am always inspired to teach and join women on rides because there aren't too many of us out there! I love horseback riding as much as biking and miss my horse!